A UEFA Cup and La Liga winner with Valencia. A Champions League winner with Liverpool. A Europa League winner with Chelsea. Stints with Napoli, Inter Milan and Real Madrid. Rafael Benitez is a football journeyman. One would hardly associate Benitez with a struggling team given his impressive CV. From managing a team of Galacticos to managing a team that was relegated, been promoted again, and is constantly just fighting to stay in the Premier League, the ride hasn't been easy for the Spaniard. But, given circumstances, could he have done any better at Newcastle United? There's Mike Ashley, on one side, with the stinginess and the dour refusal to spend money on the players that Benitez needs. There's the ever-expectant Gallowgate End, and all of Newcastle, who want nothing but a win everytime the Magpies step of to the turf at St. James' Park. But even them, even those crazy bare-bodied men who show off their chests on unbearably cold winter nights in Newcastle are on Benitez's side, despite not getting the results they want, as often as they want. Benitez has done an unbelievable job at Newcastle, let nothing tell you otherwise. This is a journeyman team, much like their manager. But, somehow, over the last two seasons, just when you think they're down and out, Benitez and Newcastle turn on the style, they produce the results. And somehow, even with the flow of cash from the top being minimal, Benitez has built a squad of players that he likes, and the squad of players love their manager too. They work their bottoms off, for him. That is one of the big reasons why the team is on a good run of form, spearheaded by the brute relentlessness Solomon Rondon and the guile of Ayoze Perez. Their way of football is down to the genius of Benitez. Their fight against relegation and the steady progress, for the most part, has been one of the major talking points this season. One may wonder, as to why he does not get the credit he deserves. Often, we stand up and applaud Newcastle United for producing some inspired displays (like the one against Manchester City). These performances showcase that the club does possess good players. While the players take the plaudits for the sparkling performances, Benitez is happy to let the players soak in the atmosphere, never spoiling their moment while only producing that occasional smile and patting himself on the back. His tactics and background work won Newcastle some games they had no right to win. Let us take a moment and go back to the turbulent time at Real Madrid. Having worked at the club in his earlier days as a young budding manager, it should have been seamless. It became a near nightmare of an experience. From the time he stepped into the club, the fans were against him, the players hardly delivered. He was relieved of duties mid-season. One has got to feel for him because Real Madrid won the Champions League that year. When he was appointed as the caretaker manager at Chelsea, fans never bought into him or his ideas as he managed Liverpool at one point and even led them to a Champions League crown. Europa League triumph was but an illusion which did not lead to him being made the permanent manager. He just did his job. A fine job too. Steadying the mighty blue ship is no mean task (Ask Maurizio Sarri!) and Benitez did it with perfection. Napoli under Benitez were electrifying. He transformed that team into a mighty attacking team with the goal machine, Gonzalo Higuain leading the line. The foundation to the famous Sarriball (the free-flowing football played Maurizio Sarri, the man who succeeded Benitez) was laid by Benitez. Yet, the man gets so little credit for the job he did week in week out. The sense of gratitude, almost missing. Back on Tyneside, the Toon Army must be pinching themselves even now when they see Benitez in the dug-out. He has worked wonders with a shoestring budget, even though the recent purchase of Miguel Almiron, the club's record signing, shows otherwise. One can only wonder how Benitez remains to be a man who rarely gets the plaudits even after displaying qualities to pull a team out of trouble and deliver top quality results. His trophy cabinet is bigger than most of the teams in the league, combined. The media and the fans of clubs gone by have slated Benitez, but the man is a football connoisseur. He is a perfectionist and will get the best out of the players at his disposal on any given match-day. A hard man to convince, he may be, but there will be few who can match the charisma and the football knowledge that Benitez possesses. 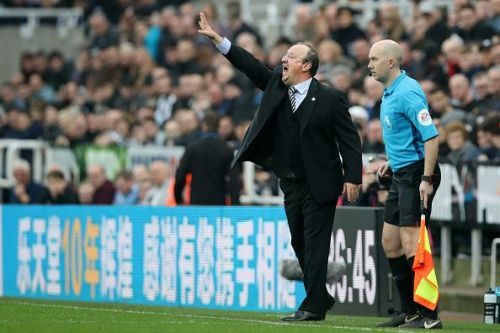 The curious case of Rafael Benitez is one that might go into football folklore as someone who won almost everything and yet, the neutrals and the fans were almost oblivious to his achievements. He won a Champions League title with that Liverpool team, against that Milan team, for God's sake! There was Kaka and Crespo, Maldini and Nesta, Shevchenko and Cafu. And yet, there he was, with the Djimi Traores and Harry Kewells of the world - going toe-to-toe, beating them. For Rafa Benitez though, when has external appreciation ever mattered? He'll keep doing his job, stellar at most times, he'll keep getting his teams to punch above their weight, and in the end, the glasses will go into the pouch, and Benitez will go on. These are the facts! Newcastle loves Benitez. Benitez loves them back. Maybe, with a little more help from those above him, he can bring Newcastle back to where they once were.